Is setting apart Rupees 80 Lakh every year as budgetary allocation to the Travancore Devaswom Board. Is spending substantial amounts for the welfare of Sabarimala pilgrims and the development of the shrine. Had sanctioned a sum of Rs 3 Crore for cleaning and waste disposal activities at Sabarimala. had set apart a sum of Rs 5 Crore this year towards the conduct of Police Mess in Sabarimala. Had last year spent Rs 80 Lakh for the purpose of Medical Team at Sabarimala. Had set apart a sum of Rs 3 Crore for the various Local Self Government Institutions en route to Sabarimala for developmental works. Allotted the Board Rs 1, 56, 46,103 for the purpose of purchase of security systems at Sabarimala during the previous year. Had spent huge sums under the auspices of Public Works, Motor Vehicles and Water Resources Departments in relation to Sabarimala. It has a constitutional and administrative obligation to expend such sums for the welfare of the pilgrims and betterment of the Board. The Supreme Court is to take up on January 31 the BJP leader’s plea to relieve the Travancore and Cochin Devaswom Board of government control and make them independent. “Income from the temples go to the Boards’ bank accounts and not a single paise is transferred to the government treasury,” the state said in an affidavit filed last week and the apex court asked it to file a detailed affidavit it. Swamy’s petition was earlier dismissed by the Kerala High Court. In his plea, Swamy has contended that he was aggrieved by the Kerala HC’s refusal to strike down various sections of the Travancore-Cochin Hindu Religious Institutions Act, 1950. “The two Devaswom Boards administer most of the temples situated in the erstwhile Travancore — Cochin part of the present State of Kerala that includes Kollam, Trivandrum, Ernakulam, Idukki and Thrissur Districts in Kerala and part of Kanyakumari District in Tamil Nadu,” the plea stated. The board is chosen by the government of the day and the incumbent Marxist led government has filled it with left fellow travellers. The current board has earned the wrath of the Sabarimala devotees for not filing a revision petition after the September 28 verdict and it was only after widespread protests that it took a late call and two weeks ago filed a revision petition to add to the 49 that were already filed in the SC. 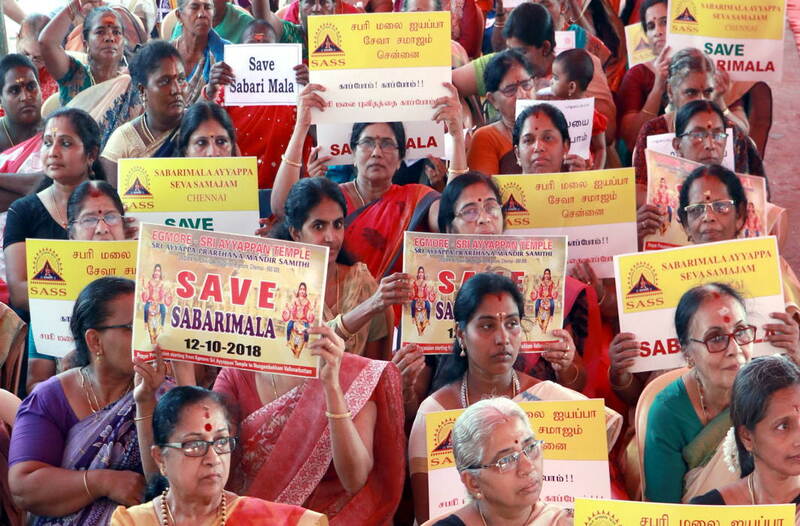 On September 28, SC gave a landmark judgment to lift the ban on entry of women between the age group of 10 and 50 years of age into the Sabarimala temple. Ever since the verdict, Kerala has witnessed massive protests across the state supporting the age old custom and not supporting the SC judgment. Kerala High Court had earlier directed the TDB to inform it about the provisions made to make the temple accessible for women and had also asked the government to appoint a woman inspector general (IG) in the core committee which will be in charge of crowd management at the temple.